12th June 2016 – The top billing of the inaugural Racers Track Club Grand Prix meeting in Kingston was reserved for the men’s 100m final. Despite a stumble shortly after the start, Usain Bolt (JAM) was able to overhaul his rivals and take the win. 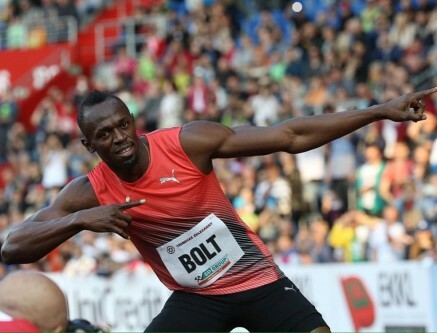 Usain clocked 9.88 seconds, a seasons best and the second fastest time in the world this year. Kemar Bailey-Cole (JAM) also ran a seasons best of 10.00 seconds to finish fifth in a high quality race. Jenna Prandini (USA) ran an excellent bend and held her form well to finish second in her own seasons best of 22.39 seconds in the 200m. In Geneva it was great to see Perri Shakes-Drayton (GBR) continue her comeback as she made her first individual appearance in three years. Perri ran 52.59 seconds for sixth place in the 400m. Rhys Williams (GBR) was fifth in the 400m hurdles and Dina Asher-Smith (GBR) was part of the victorious British women’s 4x100m team at the same meeting.